Manual de Servicio Espanol Clic Aqui! Bedienungsanleitung Deutsch Klicken Sie Hier! Service Manual Français Cliquez Ici! These products are electronic versions of the Factory Service Manuals in adobe pdf format. If requested a CD-Rom or USB Drive copy will be mailed out for an additional charge of $8. After purchasing you must log into your AF1 Racing account to download the manual, or wait for delivery of the CD-Rom or USB Drive, if that option was chosen. Haynes Motorcycle Maintenance Basics Manual Some of the pride of ownership with less common 2 wheeled brands comes from doing your own work. Let this manual help you understand the fundamentals. Haynes Motorcycle Electrical Basics Manual Some of the pride of ownership with less common 2 wheeled brands comes from doing your own work. Let this manual help you understand the fundamentals. Haynes Motorcycle Advanced Techniques Manual Some of the pride of ownership with less common 2 wheeled brands comes from doing your own work. Let this manual help you understand the fundamentals. Haynes Motorcycle Basics Manual Some of the pride of ownership with less common 2 wheeled brands comes from doing your own work. Let this manual help you understand the fundamentals. OEM Moto Guzzi Service Station Manual .PDF Download. This is a factory service manual for Moto Guzzi California 1400 Custom and Moto Guzzi California 1400 Touring. OEM Moto Guzzi Service Station Manual .PDF Download. This is a factory service manual for V7 Stone II ABS, V7 Special II ABS, V7 Racer II ABS, V7 II Stornello ABS. 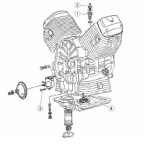 OEM Moto Guzzi Engine Manual .PDF Download. This is a factory engine manual for '13-'15 V7 Racer, V7 Stone, V7 Special. OEM Aprilia Wiring Diagram.PDF Download. This is a factory wiring diagram for V7 Stone II ABS, V7 Special II ABS, and V7 Racer II ABS. OEM Moto Guzzi Wiring Diagram.PDF Download. This is a factory wiring diagram for Moto Guzzi California 1400 Custom and Moto Guzzi California 1400 Touring.